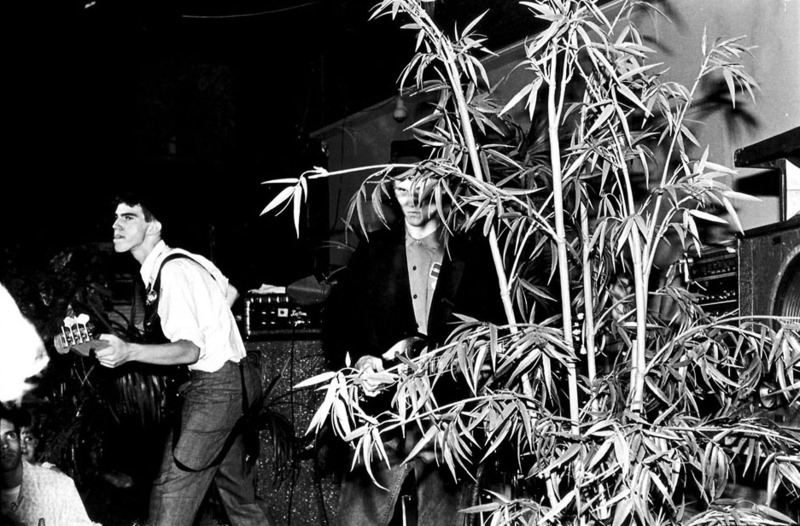 The original lineup included Dan Joseph (guitar, synthesizer and drum machine programming), Eric Anderson (bass) and Colin Sears (vocals and synthesizer). Sears would leave the band before their first public performance and appears as vocalist on the band’s entry on The Halloween Cassette compilation released by WGNS Recordings (1984). Joseph and Anderson continued to develop instrumental material for some months before being joined by drummer Don Zinzell, completing the lineup of record on their one and only release, the six-song EP Eden Revisited (Fountan of Youth Records, Bethesda, MD, 1985). The band performed a number of concerts in the Washington, DC area sharing bills with such bands as Gray Matter, Madhouse, Rude Buddha, Grey March and Glorious Din. While Troubled Gardens was ostensibly an instrumental band, guest vocalists would occasionally join them in performance on one or more songs. For the Eden Revisited sessions the band invited several vocalists – Joe Aronstamn and Marc Lambiotte of Grand Mal, Zach Fuller of Scythian, and the DC scenester known simply as “James” – to prepare lyrics for specific tracks. Their efforts are heard on three of the album’s six tracks. Troubled Gardens abruptly disbanded in the fall of ’85 as two thirds of the band left town to attend college.